DNA testing – whether ancestry, relationship or some other kind – definitely looks like a complicated endeavor that involves visiting testing centers and labs, giving blood or other relevant samples, and filling out a bunch of forms. In reality, with modern direct-to-customer DNA testing companies, you can embark on this journey from the comfort of your own home without any complicated procedures. 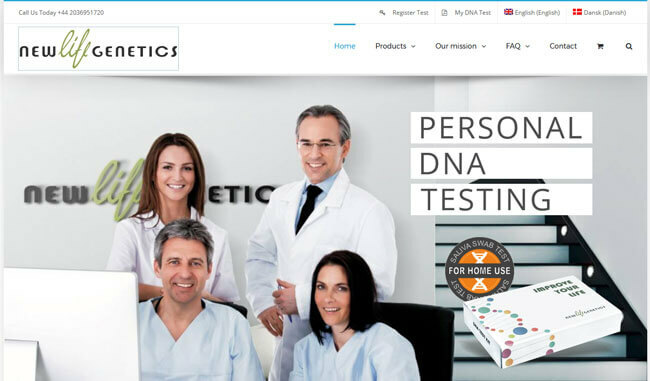 In order to make the entire process even easier and more convenient, our professional team has comprised a list of the best at home DNA tests of 2019, offered by the most reputable companies on the market. Take a look at our final results and learn all there is to know about at home DNA testing along the way. MyHeritage is an Israeli provider of reliable and accurate at-home ancestry DNA testing solutions paired with an impressive collection of old records, documents, and other genealogical sources. AncestryDNA is a genetic test offered by Ancestry.com, the world's largest genealogical enterprise. The test explores autosomal, maternal, and paternal ancestry and complements it all with historical records. 23andMe is renowned as one of the most reliable DNA testing companies. It provides extremely accurate ancestry results that reach as far as our Neanderthal relatives. New Life Genetics offers a variety of at-home DNA tests in order to enable its customers to lead better lives and maintain a healthier lifestyle designed to fit their genetic requirements. The youngest company on the market, Living DNA offers the widest geographical coverage, which allows for highly-accurate results concerning your ethnicity and the migration patterns of your ancestors. Family Tree DNA is a product of several industry giants aiming to build the ultimate DNA testing enterprise. It offers the greatest number of separate tests, cutting-edge technology, and affordable pricing. TeloYears is a DNA test designed to determine the cellular age encoded in your genetic signature and compare it with your "real" age in order to tell you how your lifestyle affects your aging process. GPS Origins is a DNA test developed to provide the most precise and accurate results about your ancestral origins. It was created by Dr. Eran Elhaik and developed by DNA Diagnostics Center. Live Well Testing was launched to provide an e-commerce outreach for all kinds of DNA testing solutions and help its users determine the probability of biological relationships from the comfort of their homes. JScreen is a Jewish non-profit organization dedicated to screening for more than 200 genetic diseases and conditions. This is by far the largest at-home screening panel currently available. In order to be featured on our top list, DNA testing companies needed to fully satisfy 6 strict criteria. These criteria correspond to the key qualities of at home DNA tests and test providers and include the quality and accuracy of the tests, as well as the likelihood of test errors and failures. In addition to the previously mentioned criteria that point to the reliability and usefulness of the test results, we employed 3 criteria related to customer experience and satisfaction. These include average turnaround time, quality of customer service, and value for money. After comparing DNA testing providers based on these criteria, making a list of the best at home DNA testing companies was easy. Taking into account all the information provided in this guide, you shouldn’t have a problem with choosing the absolute best company for your specific needs. MyHeritage is one of the few companies that offer a combination of ancestry exploration using your unique DNA profile and genealogical sources like old documents, records, photos, diaries, and other relics of the past. The company was founded back in 2003 in Bnei Atarot, Israel, by Gilad Japhet, an avid family historian and successful entrepreneur. Apart from its official headquarters, the company also features branches in New York in Utah. One of the biggest advantages of MyHeritage is that you can take its ancestry DNA test from the comfort of your home. 93 million users spread across 190+ countries can attest to the reliability and overall convenience of this testing model. Once your DNA test results are generated, you can inspect over 8.96 billion historical records and 2.7 billion people in family trees and connect with your unknown relatives. You can use everything MyHeritage has to offer even without ordering the DNA test. The company works closely with Family Tree DNA, 23andMe, and AncestryDNA, allowing you to transfer your results if you already did the test with one of these companies. MyHeritage is a subscription-based company that offers several plans to customers who already had their DNA sequenced. There’s an entirely free plan, which allows you to enter up to 250 people in your family tree and provides you with 500 MB of storage. The Premium subscription plan, which is billed annually, costs 9.17$ per month. It allows you to put up to 2,500 people in your family tree and gives you other benefits like priority support and access to Family Tree Builder Premium and Enhanced Smart Matching. The PremiumPlus subscription removes family tree limits and gives you full access to Instant Discoveries. AncestryDNA is just one segment of Ancestry, the largest genealogical conglomerate in the world that also boasts 20 billion uploaded documents, historical records, photos, and more. AncestryDNA’s only test (99$) encompasses both autosomal and gender gene research, which means you’ll be able to get results on your entire genome without having to order 3 separate tests. On the other hand, separate results are no longer available, so if you want just your paternal or maternal line examined, AncestryDNA cannot be of help to you. AncestryDNA test provides insights into your DNA matches within the biggest database in the industry, an ethnicity map, which offers an interactive way of locating your distant DNA relatives throughout ancient times, DNA circles, which allows living relatives to gather in clusters around one common historic ancestor, and “Map and locations” map for subscribers to the Ancestry Magazine, which indicates the birth locations of your direct DNA ancestors within 10 generations or less. The screening process examines 700,000 genetic markers and looks for potential Native American heritage as well. AncestryDNA also allows for raw data download, so you can use your results with free genealogy websites and other DNA testing companies. Backed up by impressive corporate giants like Google, Genentech, New Enterprise Associates and others, 23andMe met all the prerequisites for greatness very early on. It is among the rare DNA testing companies today that do not only offer ancestry results but health-related reports as well. 23andMe Ancestry Service test (99$) offers the identification of your genetic relatives from the past, with percentages of shared DNA for every single one, examination of your genetic heritage, which answers the question where your genes originated from, definition of haplogroups that pinpoint the origins of first humans ever to carry your DNA, and the percentage of your DNA that is left from your Neanderthal ancestors. The genetic heritage part of the test explores 31 world regions and the company is working on expanding the number of sample populations, which would make information on your DNA ancestors throughout history even more precise. The health or medical portion of the service is developed to locate carries genes with the capacity of causing outbreaks of hereditary conditions. 23andMe health results define potential exposure to 8+ genetic health risks, 41+ health conditions, 19+ personal traits, and 7+ wellness traits. The health report is optional and costs 100$. New Life Genetics features one of the most interdisciplinary teams of scientists on the market, covering the fields of genetics, health, nutrigenetics, nutrigenomics, sports, nutrition, and dietetics. This symbiosis of genetics, biotechnology, and dietetics form a scientific foundation for everything New Life Genetics is or will ever be. New Life Genetics offers a wide range of different testing solutions that will show you what exercise regimens are best suited for your DNA composition, how to work together with your genetics to successfully lose weight and combat acne and other skin conditions, how stress affects your genetic type, what unique talents are inherent to your DNA, what genetic strengths and weaknesses are encoded in the DNA of your baby regarding to their immune system, intolerances, allergies, tooth decay, and more. The prices range from 118.05$ (DNA Allergy Test) to 296.61$ (Sport & Fitness DNA Test for Men/Women). New Life Genetics currently ships to 35 countries of the world (with free shipping), guarantees complete anonymity throughout the entire testing process, and offers a generous 30-day money-back guarantee. Living DNA is by far the youngest company on our list of the best at home DNA test providers. It was founded in 2016 as a subsidiary of DNA Worldwide Group. This fresh platform was a result of collaboration with Family Tree DNA, Scotland’s DNA, and over a hundred leading scientists, academic researchers and genetic experts. Living DNA has the widest regional coverage, examining 80 different world regions for your potential DNA ancestors. The British Isles alone are covered via 21 regions, offering the most detailed and precise results for people from the UK. The company offers a single ancestry test that can be perceived as 3 tests in one. This means it covers both the autosomal and gender chromosomes, providing results on your family tree in its entirety, as well as direct paternal/maternal lineages. The price of the test is 159$. The test examines 650,000 genetic markers and pinpoints your family ancestry among 80 genetic populations, which uncovers your true genetic ancestors and the origins of your DNA. You’ll also receive a full analysis of your direct maternal and paternal ancestry lines and the “Back in Time” map with a comprehensive overview of your family’s geographical outlines throughout history. The software and methods used by the company are developed by more than 25 experts, aided by leading Oxford and Bristol academics. Family Tree DNA was founded as a division of Gene by Gene specializing in genetic genealogy. By the time it was established, Gene by Gene had already successfully performed more than 5 million DNA tests. Family Tree DNA offers 3 main groups of tests, with several subgroups and variations. It even features different promotional bundles, so the possibility of choice is truly broadened to satisfy even the most delicate of requirements. 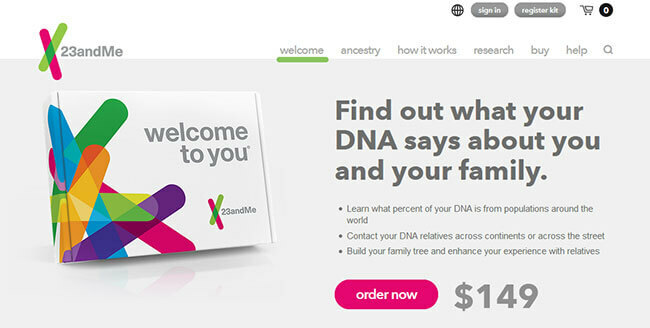 If you opt for the company’s main test, which is called Family Finder (79$), you will be able to find and connect to potential relatives, trace your ancestors throughout history, build your own family tree, and explore solitary chromosomes with the Chromosome Browser tool. The test checks 16 generations of your forebears, possibly locating the ancient relative that started your genetic line. The test also checks for potential Jewish heritage. Besides its autosomal DNA ancestry test, it also provides separate Y and mitochondrial tests, so if you want to learn more about just your fatherline or direct maternal lineage throughout the centuries, Family Tree DNA may be the right choice for you. Other factors going in this company’s favor include one of the biggest user databases, inspection of potential Jewish heritage, modern facilities and technologies, frequent webinars, a rich knowledge base, worldwide shipping, free result updates, transfer of your results from AncestryDNA and 23andMe, personalized customer support, and more. TeloYears is a genetic test developed by Telomere Diagnostics, Inc. One of the four scientists that founded the company back in 2010 was Dr. Elizabeth Blackburn, the winner of the 2009 Nobel Prize in Medicine for her pioneering work in the field of telomere biology. The purpose of TeloYears test is to measure the cellular age encoded in your DNA and relate it to how well you’re aging. The test results should inspire you to make improvements in all fields of personal wellness. TeloYears test utilizes blood samples to extract your DNA and calculate your genetic age based on the average length of your telomeres. Additionally, it will compare your telomere length (ATL) to other individuals of the same age and gender. The test should be repeated every 3-6 months in order to monitor the effects of certain lifestyle changes over time. The company will help you track your TeloYears results completely free of charge. The average turnaround time is between 3 and 4 weeks. On top of all this, your test results will also come with a unique TeloYears Blueprint for Aging Well, which represents a crucial tool for those willing to take action and get the most out of their TeloYears experience. The price of the test is 99$ + S&H and you also have the option of purchasing the “Now and Later” pack, which saves you 20$ on two bundled tests. Telomere Diagnostics Inc has also introduced its own ancestry DNA test recently called “Advanced Ancestry,” which you can order for 99$ + S&H. TeloYears + Advanced Ancestry costs 199$ + S&H and it also gets you priority processing. If you wish to discuss your results with an expert, you can go for the TeloYear + TeloCoach option for 199$ (free shipping). GPS Origins is an ancestry DNA test created and sold by DDC (DNA Diagnostics Center). The acronym stands for “Geographic Population Structure,” denoting the overall accuracy of the test. Its main selling point is the ability to pinpoint the exact location of your DNA strain throughout history, going 1,000 years in the past. Dr. Eran Elhaik, the multidisciplinary team leader at the University of Sheffield, is the creator of the GPS Origins test. DDC, on the other hand, was founded in 2005 with the idea of making scientific achievements available to the general public. The company is well-known for its hi-tech testing facilities and robotics technology utilized for DNA sequencing. GPS Origins ancestry test checks 800,000 genetic markers and covers 41 world regions with 1,000+ reference populations. It reaches around 1,000 years in the past and is able to point to the exact town or village of your genetic origin. Furthermore, the unique composition of your genetic signature is explored and compared to over 10,000 DNA signatures located in the DDC database. The price of the test is 199$. You can also order editions of the main test specialized for individuals of Asian and African descent. The tests will show your detailed ethnic percentages from around the globe with a specific emphasis on Asian and African ethnicity. It will indicate the migration routes of your ancestors going back 2,000 years in the past, with geographic coordinates and date stamps. You will also see the historical events that caused your DNA to appear in select regions at certain points in time. Both tests have a price tag of 199.00$. Live Well Testing is a corporate branch of Confirm BioSciences, Inc. The company is located in San Diego, California, and represents an e-commerce outreach tool for its father company. The official website offers a wide spectrum of different DNA testing solutions designed to improve the overall health and wellness of your body, pets, and environment. You can view Live Well Testing like Amazon or eBay for DNA tests. Its father conglomerate was launched in 2008 and is currently ranked among the top 25 San Diego companies. Confirm BioSciences was also listed as #1136 on the Inc.com top 5000 rankings for 2016. It is only natural that Live Well Testing followed in the footsteps of the people who created it by exercising the same level of corporate excellence. Live Well Testing offers a staggering amount of different testing solutions divided into separate categories so that you can find what you need without sifting through overly complicated menus. You can filter different testing options either by category or by purpose. The separate test groups feature corporate solutions and a comprehensive food safety trial program as well. When it comes to DNA tests, Live Well Testing offers 12 different options. The covered brands include CellMax Life, Endeavor DNA, and Labrix. The tests range from those designed to determine your blood type to relationship tests aimed at confirming or negating biological relationships. The company offers both curiosity and legal relationship DNA tests, designed to provide you with personal knowledge or a court viable document, respectively. DNA test prices range from 10.99$ (EldonCard – Instant Home Blood Type Test Kit) to 299.00$ (CellMax DNA Genetic Cancer Risk Testing Kit). JScreen is a nonprofit institution partnered with Emory University and committed to screening for the potential carriers of genetic diseases commonly present among the individuals with Jewish genetic heritage. JScreen was dubbed one of the most innovative American Jewish institutions in 2014. JScreen was created by the family hardships of Randy and Caroline Gold, both long-time Jewish community activists. Their daughter was diagnosed with Mucolipidosis Type IV (ML4) in 2009 when she was just 18 months old. This is a very severe, yet completely preventable Jewish genetic condition. The Golds founded JScreen when they discovered that the carrier test they performed included only 9 out of the 19 most frequent genetic diseases found in the Jewish population. In addition to screening for those 19 conditions, the company’s test covers an additional 180 genetic diseases. JScreen primarily specializes in diseases inherited in a recessive pattern, which means that the child can only “inherit” the condition if both parents are carriers of the non-working gene for that specific condition. This is especially important since individuals who carry recessive conditions do not exhibit any symptoms since they have only one copy of the non-working gene. The price of the test is 149$ with private insurance. If you can’t afford it and still want to get tested, you can check if you’re eligible for the company’s financial assistance program. JScreen is quite different from all other Jewish gene screening programs. The usual programs often require that you visit a community screening event, Medical Center or your family physician’s office. Eligible participants in JScreen’s actions, on the other hand, can obtain all the necessary information about the program and perform the screening from the comfort of their own homes. At-home DNA testing involves a pretty simple procedure that requires very little effort on your part. It all starts with you placing an order on the official website of the company of your choice or with licensed retailers. Once your order is received, the company will send a unique personal DNA testing kit to the specified address. When your kit arrives, you may need to register it on the official website. Every testing kit features a unique ID code usually found on the sample container. All you have to do during the registration process is enter that code on your personal account. Once your kit is registered, you can proceed to collect the relevant sample (saliva, buccal cells or blood) and secure it in the provided container. If you’re collecting saliva or buccal cells, it is recommended that you avoid eating or drinking anything but water for at least half an hour prior to sample collection. Food and beverages can contaminate the sample, which can lead to test failure. If you’re performing a buccal swab, make sure the cotton ends never touch anything but the inside of your mouth and the provided container. Any additional contact can also contaminate the sample and reduce the accuracy of your test. After collecting the sample, you should send it back to the company’s lab for further processing. Most kits come with a prepaid mailer, so there are no additional shipping costs. However, this might not be the case with international shipping, so we suggest getting all the relevant information before ordering any tests. When the company receives your DNA sample, it will issue a processing order and connect it to your unique ID code. If you lose your personal ID code, the company will most likely be unable to retrieve it for you. Once your final report has been generated, which usually takes between 3 and 8 weeks, depending on the test, you will receive an email notification informing you that you can inspect your results on your personal account.